Bvckup 2 licenses are bound to the fingerprint of the host system. As such, acquiring a license for the app's installation involves passing the fingerprint information to the licensing server and receiving back a small text file with the license. For computers with no Internet connectivity the process remains the same, but an extra leg work is required to make the exchange between the computer and the licensing server happen. Holding CTRL tells the app to skip the online activation attempt and display "Manually..." option right away. 2. Enter your activation code and click "Manually..."
3. Top field contains the web address where you can retrieve your license. The address has both the activation code and the system fingerprint encoded into it. 4. You need to copy/carry this address to any Internet-connected computer and open it there. This is the "extra leg work" part. What you will see on the page is your license. 5. 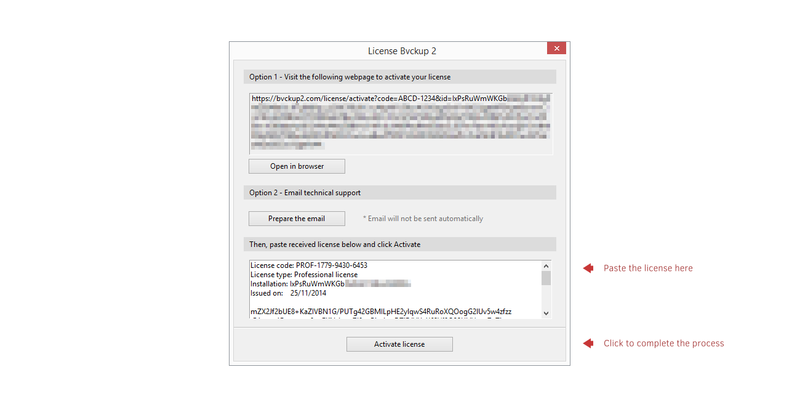 You will now need to copy the license back to the target computer, paste into the bottom field and click "Activate license"
After having been a long time user of Goodsync Pro, I used a trial version of Bvckup for a day or two. I liked it so much that purchased 3 copies for all my home PCs on the 16th. Thanks for authoring a program that is so easy to use. Alex, is there a way to deactivate the program? I will eventually want to do a clean install of Windows 10 after it's released next month. What happens when I install Bvckup2 use the same license code again? Will activation be denied? Any inputs appreciated. Viv, when you reinstall the OS no deactivation is required. Licenses are bound to about a dozen system parameters and only small part of these change upon the OS re-installation. When the activation request comes in, the licensing server can recognize the incremental upgrade and it re-issues the license automatically. In some cases, the change may end up being too large, so the automatic re-activation will be denied - in this case just drop an email to support(at)pipemetrics.com and we'll sort you out manually. Alex, many thanks for the quick clarification. I just processed the purchase of a five pack Professional license. I have received the activation keys, and when the trial back up that is running complete, I will license a copy to the server the trial is running on. 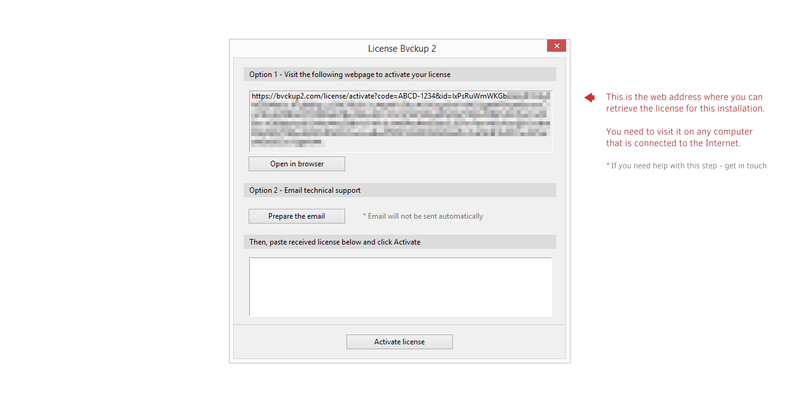 How do deactivate this license when the office closes down where we are using Bvckup 2 to replicate sync data from the server to external hard drive? I don't know if the serve will be re-purposed to another location or discarded. Either way, we would not need Bvckup 2 running on this machine after the office closes. So, how do I free any license up to be registered to another machine? For a one-off deactivation the simplest would be to just email support@ and we'll take care of it. When I click on any of the links above, even though I am logged in, I get presented a username / password login box. Supplying the required information cycles back to being prompted again. Cancelling, goes to a 401 access denied error page. I was able to tweak the server that I needed to activate into getting around the IE ESC by turning that off and entering our proxy information directly so the server could connect to the internet to process the activation. I would prefer not to have to do that in the future, so offline activation would be ideal. Would you please check the permissions for the links above and / or give some guidance if I need a different username password than the main account or forum registered login? @NARBS - whoops, an artifact some spring clean up on the server. Patched up the links and fixed the permissions, please give them another try and they will work.